The clay-rich loess soils that line the banks of the Danube give rise to the world’s greatest expressions of Grüner Veltliner, and Weingut Hirsch’s are hailed by critics as some of the best and most exciting. Johann Hirsch is a visionary young producer: The first winery in Austria to go all-Stelvin. The first to delay bottling and release of the Grand Crus. Vineyards fully converted to biodynamics. Five generations of the Hirsch family have managed the farmstead since it was acquired in the late 19th century. A true family winery, vineyard sites are tended by generations of husbands and wives, brothers and sisters. In the 1990s, as demand for red wine boomed in Austria, all red varietals were torn out. Johann watched his father, Josef, strike a principled course. He recognized that the Kamptal land’s true potential lies in the production of Riesling and Grüner. Today, the winery is fully dedicated to light, enchanting terroir-driven wines made solely from these two varietals. Hirsch’s dedication to the Kamptal region is tied specifically to the municipality of Kammern. Johannes is quick to emphasize the heritage and origin of his wines, and has made the village known among wine-lovers around the world. The Heiligenstein vineyard, volcanic rock blanketed in desert sandstone, is considered one of the very best vineyards in all of Europe. 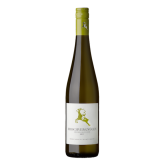 The Riesling made from the site carries the Hirsch hallmark characters of intense fruit and a broad aromatic profile at a relatively low alcohol content. Another gem is the charmingly named “Hirschvergnügen”, an easy-drinking Grüner produced each year. The wine’s label design changes from vintage to vintage, always playing upon the Hirsch name, Austrian for “stag”.